Our products are strictly inspected and tested to ensure the quality of products meets the standards. Professional after-sales service team serves you for 7*24 hours. We provide you with 1-year free warranty and 45-day return or exchange service. (1)360-degree and multi-directional protection: It is waterproof, shock-resistant, dustproof and snowproof. You can enjoy surfing, fishing, swimming, snorkeling, diving, rafting, camping, hiking, climbing, jogging and other outdoor activities with it. (2)Durability and stability: Compared with the plastic lids of other waterproof cover, the TPU material of its shell and rubber inflatable plug are more durable. (3)Sensitive touch: Its compact front-mounted and built-in screen savers offer smooth and fluent touch experience. (4)High Clear Voice: It has improved voice. It is waterproof with sound transmission gas-breathable membrane vents at the bottom of the box. (5)Ultra-lightweight and slim design is very portable and stylish. The transparent front and rear covers of the camera lens can ensure high quality and high-definition photos and video. (1)Please do Water Test according to the User Manual. (2)The built-in Screen Protector is Scratch-Resistant, so please don't align additional Glass Screen Protector. (3)The original size charge cable is correct. Please pay attention to the width of your charging cable. EXTREMELY WATERPROOF: Fully submergible to 6.6ft(2 meters) for 30 Minutes exceeding IP68 standard Waterproof rating, great protection for any underwater activities and feel free to enjoy your swimming underwater photos. SENSITIVE TOUCH: Completely access to all buttons, ports and features, like touch ID, cameras & speakers, power button, charge port and volume buttons; Lightweight and slim. 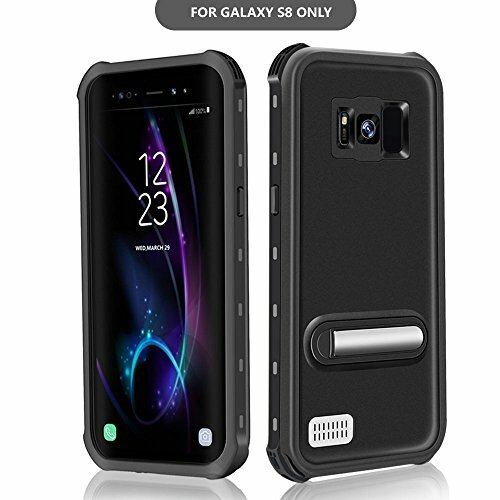 MULTI-PROTECTION: 360 full body protection design to exceed Military Standard, guard your phone even after 1000 times drop from 6.6ft (2 meters) height. The case is also Snow/Dirt/drop proof, rugged to adapt to all harsh environments. EASY INSTALLATION: Fully sealed even after 1000 times open and close. Two covers (front/back) snap on design makes it fast and easy to install or take off. WHAT YOU GET: It is equipped with high quality samsung galaxy s8 water resistant case and 360-degree full body protection. You can enjoy 1-year warranty and friendly customer service. If you have any questions about this product by Besinpo, contact us by completing and submitting the form below. If you are looking for a specif part number, please include it with your message.